Oneof the mornings Conor & Liam hit the local hardware store for some brand new fishing gear. 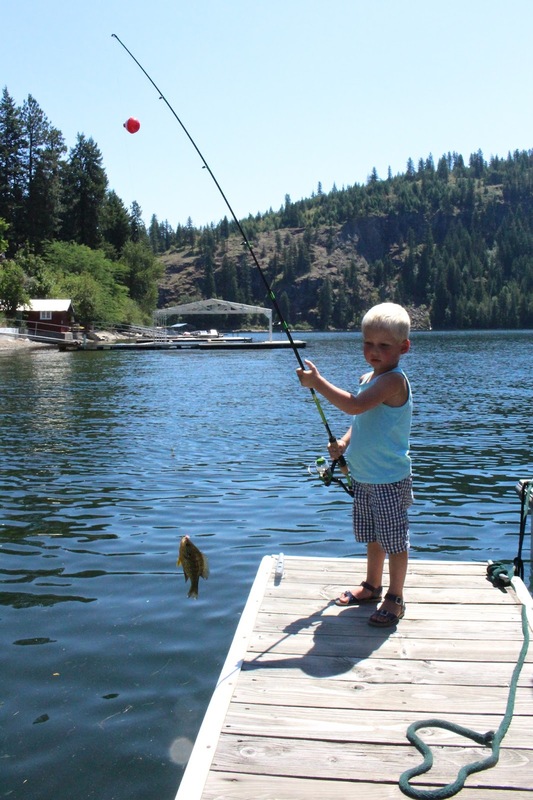 I have spent countless hours fishing off this same dock throughout my entire childhood. 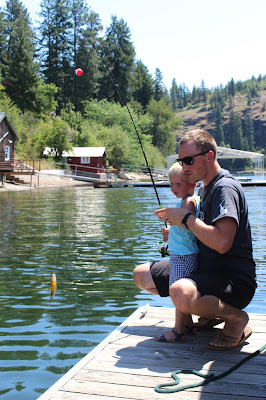 Many a sunfish & perch have been caught, with the occasional rainbow trout or catfish. I was all about the worms & the hooks, while my brother was terrified of both. I always had to bait his hook for him as well as get the fish off. Well, it turns out Liam takes after his Uncle Ryan. He pretty much wanted nothing to do with worms or hooks & refused to touch both. He was also much more interested in some skinny dipping rather than fishing. Nonetheless, with a little help from Conor, Liam caught his first sunfish! I can't wait for many more morning spent this exact way! 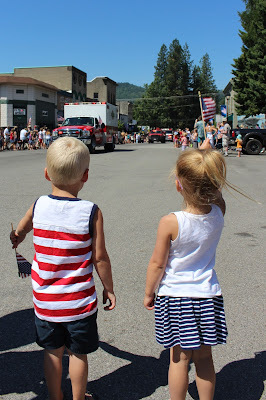 The morning of the actual 4th, we went "downtown" (1 stop light, 4 bars, hardware store, pizza place, & icecream shop...all the essentials really) for the local parade. Liam loved all the firetrucks & police cars! Finn snoozed away while big brother frantically chased down candy that was thrown our way. I've never been a big parade fan myself, but I'll go for the candy! 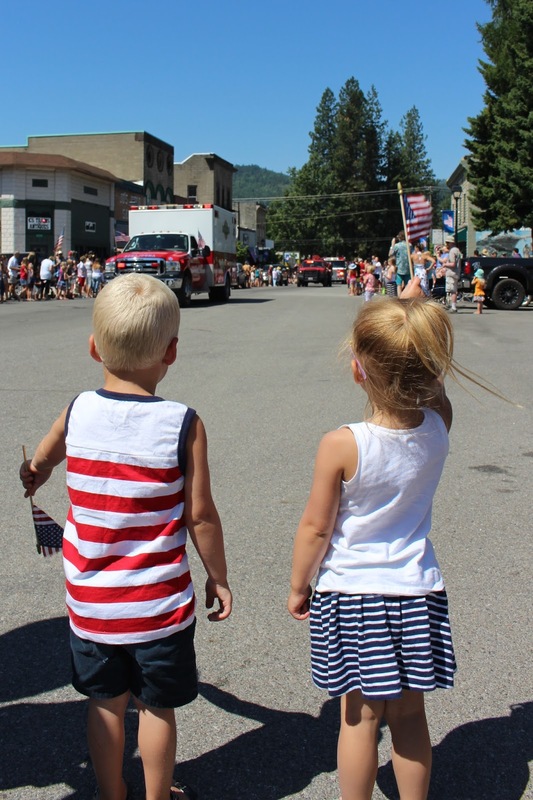 There is something really special about celebrating the 4th in small town America! It's a good reminder to slow down your pace of life, & truly appreciate this wonderful country that we have the privilege of living in. It's all about saying hi to your neighbor and seeing familiar faces wherever you go. 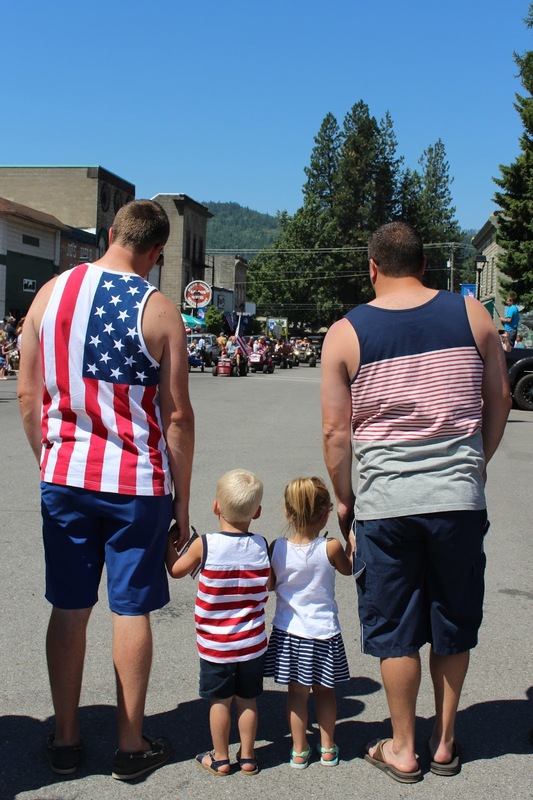 I can't imagine celebrating any other way; this small little lake town just feels patriotic! After naptime for nearly everyone (Pops included), we boated the afternoon away. Many cocktails & beers were slinged back! The boys smoked ribs & chicken for dinner to go along with the best ever potato salad (a slighter altervered version of the pioneer woman's recipe...perhaps I will share another day) & some watermelon. Just a classic American barbecue dinner! The rest of the weekend, Conor & Pops worked on building a tree house! Conor designed the whole thing, and the finished product was quite impressive. It even has a trap door! Hopefully it's at least another 18 years before Liam is having beers in it...so for now, the adults will take over that duty! It's about 6 feet off the ground, so my parent's landscaper (AKA "Scaper") added a beautiful sand pit below. It's bordered with huge boulders, making it blend perfectly into the wooded area. This is such a special addition to the lake house property; I can't wait to take Liam back to the lake so he can fully enjoy it. I can already hear his sweet voice & all the imaginative play that will happen up there! 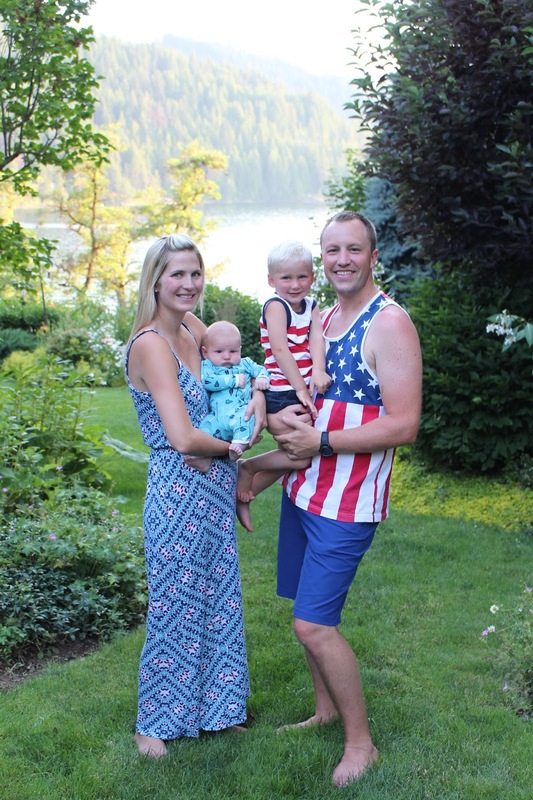 This 4th of July celebration was one of my favorites to date (minus the whole fireworks deprivation of course)! Seeing Liam with his grandparents & cousins is so heartwarming! It only makes that desire to live closer even stronger. But the distance also makes each moment even sweeter since they are treasured more! Now we are in Montana with Conor's family and enjoying even more family time. So fun! I'm with Liam... I wouldn't want to touch the worms either ;). Mama guilt is so real! But at least he will get fireworks on his birthday! Pioneer Day is a funny holiday huh? Being raised Mormon on the east coast it was never a big deal at all! I actually don't remember it growing up. I've heard they are doing more on the east coast these days, but out west it's huge! Looks like a fabulous 4th, lady! I totally agree that small towns are fabulous during the 4th. we were in Breckenridge and the town put on a fun parade and it was so sweet and memorable. Love the dress you are wearing! The pictures of the four of you are fabulous - well all the photos are fabulous actually! I love small town times - there's just something about them, you're so right! What a perfect 4th of July!! We spent all of our summers growing up in a small beach town in Northern Michigan and it really does make for the best memories! LOVE the tree house and please do share the potato salad recipe! That sounds amazing. There are plenty of opportunities for fireworks too! We went back and forth about seeing some, but in the end bedtime is pretty needed around here since Aria doesn't nap anymore. We'll just have to see some another time. What a PERFECT 4th of July weekend... it really doesn't get better than small town celebrations and the lake with family! I hear ya on putting the kids to bed... Mia definitely didn't stay up for fireworks and I don't feel guilty about it at all! She didn't know what she was missing and it makes life much happier for all when she gets her sleep, ha ha! Despite the lack of fireworks on the 4th, your 4th sounded like so much fun! I love all the festive outfits and the food and it does sound like you guys had fun. On the plus side, it seems like Liam didn't mind missing the fireworks and the fact that he will get them on his birthday is an extra special bonus! Sounds like next year's 4th will be amazing with fireworks AND that awesome tree house! Such a lovely weekend. Don't feel bad - we didn't do fireworks with Mac this year either. We put both the kids to bed early after a long exhausting day on the river. There's always next year. And truthfully, I was a little worried that they'd be loud and scare him - lately he gets really nervous about thunder or loud noises. I'm just glad they both slept through all the noise! Mom guilt be darned - it gets the best of us sometimes! Liam had just as much fun cuddling with mommy as he would have listening to loud fireworks, I'm sure. Your pictures are so lovely, friend. Looks like you and your family had a great time! So glad y'all are having such a wonderful time! Lake days are always so busy and fun!